The club has the schooner “Bantuzi” for sale. 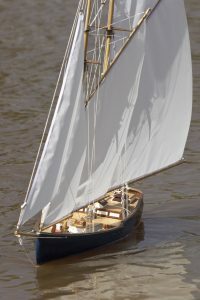 The model was built by Club member Harold Hartigan who, very sadly, recently passed away. At about1m in length the schooner has often been sailed on the pond and is offered ready to use. Click on the photo for more views of this excellent model. If you are interested in purchasing, please contact David Edwards (phone: 01425 271293) for further information.